Anjaan is an eagle ! Just in - Anjaan's Punch Dialogue ! "You think I am a pigeon that flees at the sound of a cracker ? I wait patiently and seize the prey. 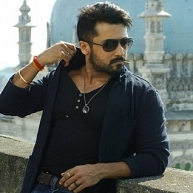 I am the Eagle... Anjaan". What could this possibly be? Make sure you read it twice. When Suriya says it on the silver screen, thunderous response can hardly make us listen to this punch dialogue from Anjaan. We have of course put up the English version of the dialogue tweeted by UTV Motion Pictures' Dhananjayan just moments ago. Imagine the effortless Suriya reciting it to the baddies. Just like the trademark punch dialogues from the Singam series, this particular verbal outrage from the Anjaan hero will definitely go viral. Keep tuning into Behindwoods to watch this dialogue in Tamil from the teaser which is slated for release tomorrow night. Jyothika to return to the big screen with beau Suriya? People looking for online information on Anjaan, Dhananjayan, Punch Dialogue, Suriya will find this news story useful.